In this issue: lasting postal evidence of vanished countries, a collection of John Muir's writings, and an anthology of gripping stories from a regular contributor to our publication. Stamp collectors travel widely—in their minds. Think of all those countries to be alphabetized and mounted in albums. 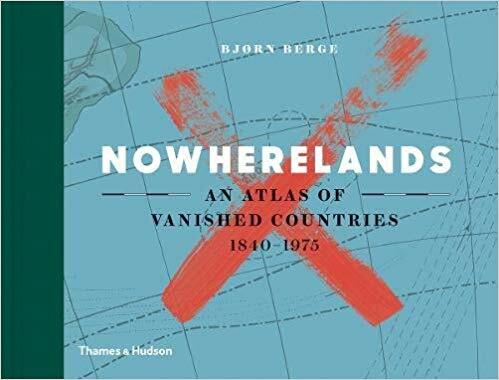 In Nowherelands, Bjørn Berge has written a true one-of-a-kinder, a history of extinct countries, each of which had once thought itself legitimate enough to issue postage stamps, but each of which, alas, has not only ceased printing stamps, it has also ceased to exist. Still, geography endures, and a dedicated traveler could certainly visit the physical sites that these defunct sovereignties once occupied. That would make for an interesting round-the-world trip: a journey from nowhere to nowhere. Some of the names of the fifty entities Berge has collected will be known to most readers: the Channel Islands, the Canal Zone, New Brunswick, Vancouver Island. Other names pose riddles: Batum, Hatay, Perak, Iquique. Well, perhaps stamp collectors will recognize them. At times, the histories sound almost made-up—so many tales of imperialists, warlords, and ne’er-do-wells, seeking power and fortune. By the end of the 1600s, more than 1,500 pirates were living on Ile Sainte-Marie, and its economy was good or even sustainable, as we’d put it today. This is the situation that prevails when some French pirates take the initiative to establish the anarchist colony Libertatia under the motto ‘For God and Freedom’. Nowherelands is a singular world tour, filled with highly interesting tidbits and anecdotes from world history. The author’s tone is rich in black humor and irony, as he recounts the dubious goings-on of the historical characters who figure in the rise and fall of these defunct countries. Who would have guessed that a book about stamp collecting would make for so many tales of human folly, greed, hubris, avarice, and treachery? The travel writer, photographer, and adventurer, James Michael Dorsey, has been shot at, attacked by baboons, dodged puff adders, ridden camels, and trekked into jungles. For Dorsey, travel doesn’t mean a week in Florida, like many of us. Travel means risking your neck in the furthermost reaches of Asia, Africa, or South America, where you might spend time with a Maasai nomadic community or with a survivor of the Khmer Rouge genocide. 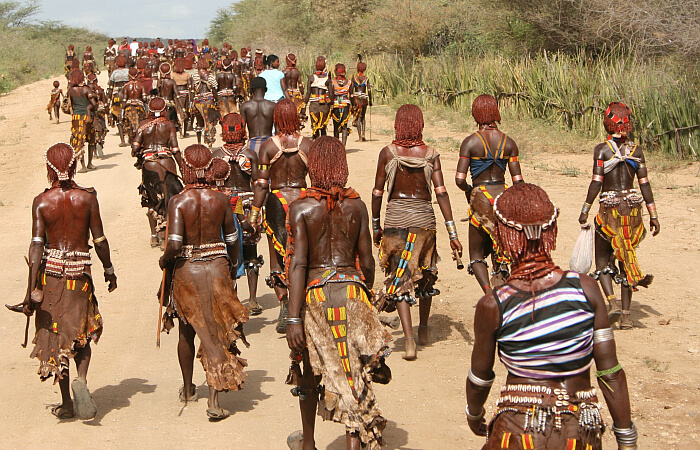 In “Conversations with a Caveman,” Dorsey joins a hunting party of Hadzabe Bushmen in Tanzania. 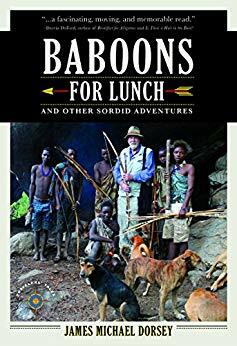 At one point, he finds himself separated from the group when a ferocious baboon appears in front of him on the verge of attack, at which point his unseen companions suddenly kill the animal with their bows and arrows. Shaking with relief, Dorsey then realizes that the hunters had used him as bait. Fearless, intrepid, and invariably generous and humane, the author likes nothing better than chance meetings with memorable characters. In Timbuktu, he meets Halis al Bokram, a muezzin, a “prayer caller” of Islam. In Kanas, in China, he is invited to supper with Mai Pin, an ancient lady, village elder, and shaman. He shares food and conversation with her family, in a state of welcome and friendship—and neither his host nor Dorsey can speak a word of the other’s language. In a deeply moving chapter, “A Stone for Henry Leman,” Dorsey befriends an elderly survivor of Auschwitz, who recounts his unimaginable life history. He would sip his coffee and relate to me the most gruesome tales of torture and survival, all said as a matter of fact with no discernable hatred or bitterness attached. From the start, I felt he was still trying to make sense of his past and at the same time, insure that his story did not die with him. He was testifying the only way he could. Dorsey’s journeys take him across the globe, from desert to jungle to mountain to town, where he describes spectacular sights and monuments. But it seems clear that, for Dorsey, the true wonders of the world are the human beings he meets along the way. Author and naturalist, John Muir (1838-1914) was an early champion of preserving the American wilderness and one of the founders of the Sierra Club. The John Muir Trail, which traverses the Sierra Nevada mountains in California, is named for him, as are numerous conservation organizations. 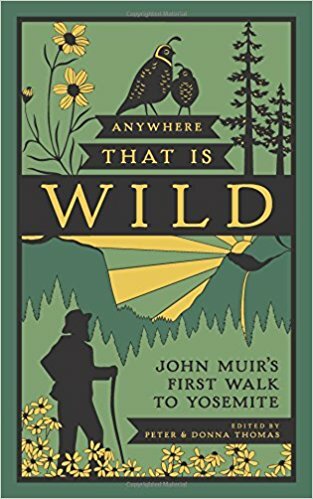 Anywhere That Is Wild is the account of Muir’s journey in 1868 from San Francisco into what is now Yosemite National Park—a kind of origin story. The handsomely-printed, slender hardback (it’s only around fifty pages) is a publication of the Yosemite Conservancy and makes for a nifty introduction to Muir’s life and work. While Muir wrote eight books and many magazine articles, he never actually produced the manuscript that comprises this book. Editors Peter and Donna Thomas created Anywhere That Is Wild by weaving selections from a variety of Muir’s letters, unpublished manuscripts, and other source materials. They then added a preface, notes, a number of illustrations, and a map to complete the fine hardcover book. As I say, this is a slender book, one that can be read in one sitting, but it is also a fascinating snapshot of nineteenth-century California, filled with descriptions of wild flora and fauna. Muir walks, rides a horse, travels alone at times, at times in the company of a fellow trekker. He encounters mountain passes, snow, frigid streams, towering sequoias, a bear. It’s hard not to agree with him that the mountains and valleys of Yosemite form a paradise unmatched in the United States.